Bosa, similarly to his brother, leaves OSU after three seasons and did not disappoint. Although he missed his last season due to injury, it shouldn’t cause him to slide down many, if any, draft boards. 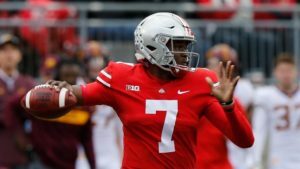 This is likely to be a common spot where people talk about a trade-up for a QB, as teams may need to jump the Raiders in order to snag Dwayne Haskins or Drew Lock. However, if the Jets don’t feel they’re getting enough return, they can take arguably the best player in the class in Quinnen Williams. Williams offers a rare combination of strength and quickness, that most men his size just don’t possess. 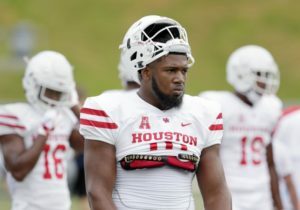 Williams will be a welcome addition to the Jets front line, as their defense needs help in several areas. 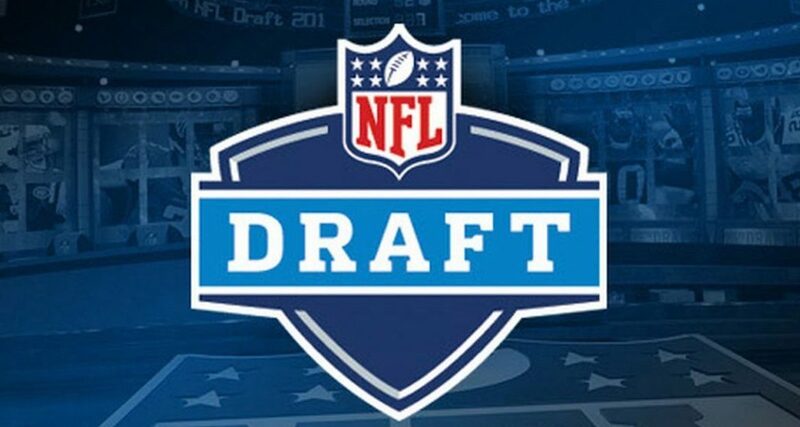 The Giants desperately need to find Eli Manning’s replacement, but they seem content for now, and don’t appear to love any of the quarterbacks in this draft. The Giants had horrible offensive line play this past season, as their right side struggled to do much of anything. 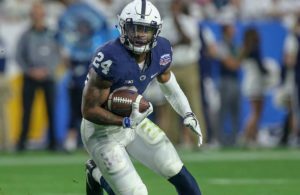 One thing they can do to help change their team trajectory is protect their future signal caller, and help open running lanes for Saquon Barkley. Taylor is the top offensive lineman in the class, and possesses a nasty mean streak. Biggest knock on him has been his false start penalties, but that is something he should be able to resolve rather easily. Jacksonville appeared to be on the cusp of a championship just two seasons ago. Now, they have replaced their “franchise” quarterback, and are having to make some cap decisions on aging players. Their defense is still mostly intact, but they do need additional people who can get after the quarterback, especially on the edge. Gary has some position flexibility, as he can play on the edge or kick inside. Wherever the Jags choose to use him, he should be a big boost to their pass rush. The Panthers need to have one goal this off-season, protect Cam Newton. Newton has constantly been running for his life the last couple years, and not by design. Newton has struggled with his health at times due to his physical nature, so keeping him lean on designed pass plays will greatly help. Jonah Williams was the anchor for Alabama’s offensive line the past three seasons, as he is a tremendous run blocker. He lacks the ideal size and length to become a left tackle, but he is a technician and likely can improve enough to be a solid one if moved over to the blind side. Regardless, he will be a tremendous help to the Panthers line, and fits in with their offensive identity. The Vikings offensive line was in shambles last season, as Kirk Cousins was running for his life, and their running game was very suspect. They need multiple upgrades along the front line, and drafting Andrew Dillard will definitely help that. Dillard is one of the top tackles on many people’s boards, and will be a nice fit in Minnesota. While it is unclear if he would start on the left or right side, he profiles as an athletic left tackle that will excel in pass protection, helping Kirk Cousins stay upright. The Oakland Raiders add yet another weapon to their offensive arsenal in Noah Fant. Fant has the acceleration and speed of a wide receiver, but the body of a tight end, which caused consistent mismatches in college. He currently lacks the technique and strength to be an inline blocker, but that is something that can be easily added throughout the first few years of his career. Jon Gruden loved using Jared Cook as a mismatch last season, and he can use Fant in a similar fashion. 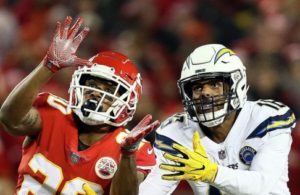 The Kansas City Chiefs had one of the most explosive offenses in the league, but definitely have holes that are appearing. They cut their star running back after a video emerged of him striking a woman, and their star wide receiver Tyreek Hill is being investigated again by authorities. They need to add a wide receiver regardless of the outcome with Hill, so here they can grab another speedy receiver in Parris Campbell. Campbell was a track star in high school, and blazed at the combine with a 4.31s 40 yard dash. Campbell didn’t use his speed to get deep often in college, as he was mostly featured on screens and shallow crosses to run away from defenders. 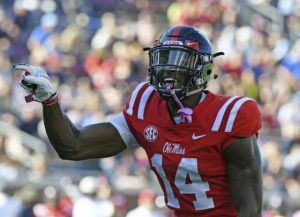 If he can develop his route tree he can easily become the top wide receiver out of this draft class. The Los Angeles Rams used a lot of resources and money last off-season in order to take a shot at a championship. It almost worked, as they ended up losing in the Super Bowl. One area they focused on stocking up on was the defensive line, and they can add more resources to it here with Jaylon Ferguson. 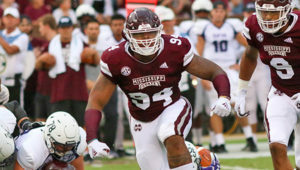 Ferguson doesn’t have the potential as many edge rushers that will go before him due to average athletic traits being displayed, but he has a great instincts when it comes to getting to the quarterback. 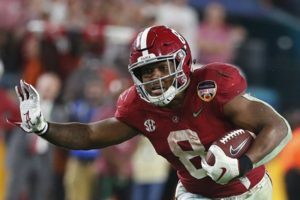 He has the potential to make an early impact as a situational pass rusher for a team that is ready to compete for a championship.